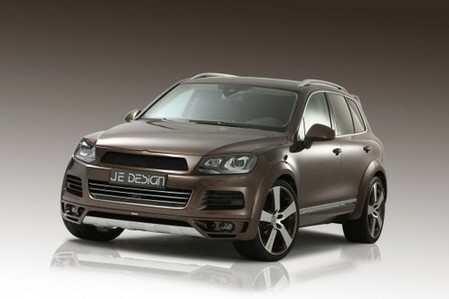 JE Design’s package for the new-look VW Touareg is finally ready and it’s a very complete one. Starting from the looks, you get a complete body kit including sports radiator grill, front spoiler, front and back wheel arch kit, rear apron insert, roof spoiler and rear hatch blend. It turns the Touareg from a discrete SUV into a wild animal for the urban jungle! It is complemented by 22-inch aluminium wheels which can be painted in different silver or black shades, or any other custom color you might like! The have also lowered the suspension by 35mm to make it look even nicer. And as for the engine, the 4.2-liter TDI V8-engine is boosted from 340 hp (250 kW) to 410 hp (302 kW) and the torque from 800 to 930 Newton metres. The car can now do 0 to 100 km/h in 5.4 seconds and has a top speed of 269 kph.